I have been on a roll lately with my thrifting (not a real word but it is to me now ha!) it seems like I am slightly addicted. Oh dear. Well this time when we came across the Children's Hospital of Seattle Thrift Store on Bainbridge Island I knew that we had buy stuff to help this great cause. When my now 25 year old little brother was born he was very premature and sick. They did not think he had much of a chance to live, it that was so hard on the whole family. The relief that my parents did find was at the Children's Hospital in Los Angeles, where we living at the time. Needless to say they helped my family and my little brother and he is a healthy 25 year old aspiring "rock star" and we have them to thank. 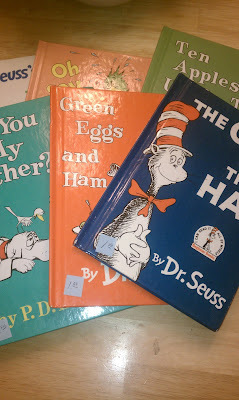 I have been wanting to get JJ Dr. Seuss books to add to his home library because every kid has them or knows about them. We had them as kids and I have fond memories of reading these classic books. Honestly though at $8 a pop I was having a hard time justifying buying a bunch of them at a time, I know I could buy one at a time but buying in bulk is so much easier. So when we found these for just $1 each at the thrift store I scooped them up! They are in great condition and were most of the ones I was searching for, The Cat in the Hat, Green Eggs and Ham, Are you my Mother? just to name a few. If you do the math if I had paid retail at $8 each x 6 I would have paid $48 and since I bought them second hand I only paid $6 for all. I saved $42 dollars, how frugal of me!!! 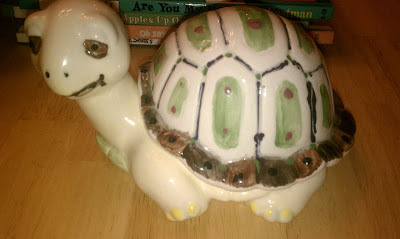 And while we were there we found this turtle for $3, the shell comes off to store hidden treasures. JJ is obsessed with turtles so we had to have him. Kind of cute huh?